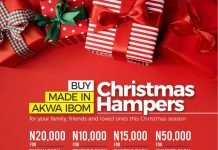 The Akwa Ibom Christmas Carols Festival is set for this year and is slated to hold on Friday, December 21, 2018 at the Uyo Township Stadium, along Udo Umana Street, Uyo by 6pm prompt. 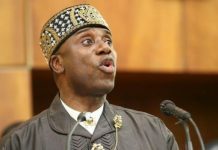 The theme for this year’s Carol Festival is “LET THE PEOPLE SAY AMEN”. 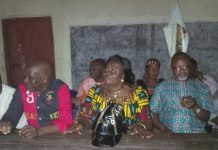 The festival, which has had ten (10) previous editions, is a carnival of songs of praise at Christmas, hosted by the Akwa Ibom State Government in worship to the Almighty God and to foster unity among Akwa Ibom people. 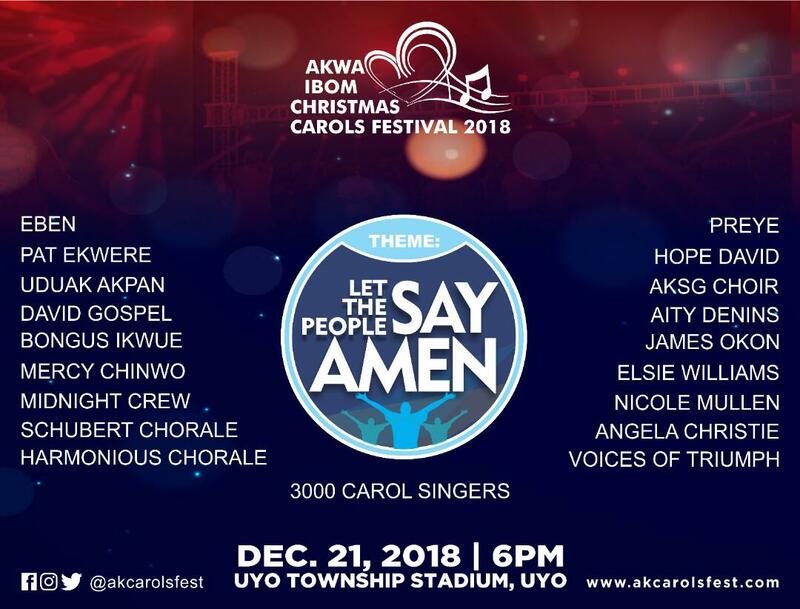 The Akwa Ibom Christmas Carols Festival 2018 will feature international gospel artistes like the multiple award winning Nicole Mullen, gospel saxophonist Angela Christie and stirring vocalist Elsie William. 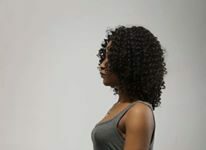 Other special appearances include phenomenal Nigerian artistes like the award winning Gospel sensations Eben, Preye, Mercy Chinwo, James Okon, the Midnight Crew, Hope David, Aity Dennis, Uduak Akpan, David Gospel, Pat Ekwere and the legendary phenomenon, Bongus Ikwue. The Officiating Minister at this year’s Carols Festival will be a special guest Minister, the Founder and Lead Pastor of House on The Rock, Pastor Paul Adefarasin. The Choirs performing at this year’s edition are the host choir, the Akwa Ibom State Government Choir, the Schubert Chorale, Abuja, Harmonious Chorale and the Voices of Triumph from Ghana as they all join the globally recognized group of singers, that was awarded the Largest group of Carol Singers in the World by the Guinness Book of World Records, to render Carols in an awe-inspiring way on the occasion. 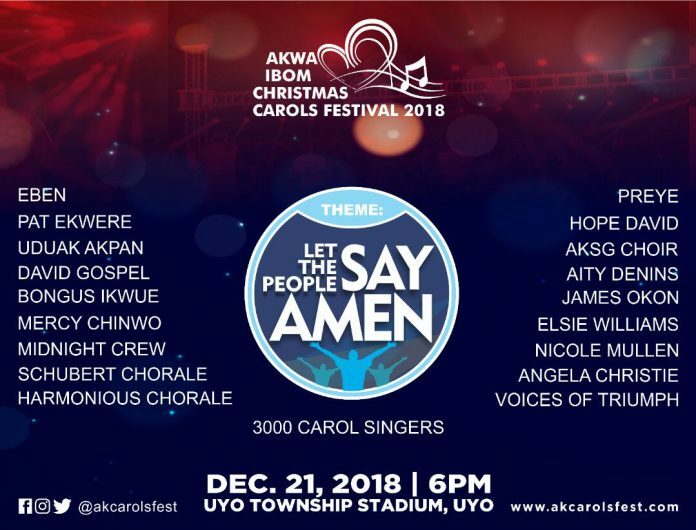 The Akwa Ibom Christmas Carols Festival which is a Christian gathering will help strengthen the bond of unity in the State as well as create a conducive ambience for spiritual growth and peaceful co-existence among groups in the State and beyond, as this year’s edition calls out to people of all walks of life from around the world to join in an evening of praise and worship. This is the 11th edition of the Akwa Ibom Christmas Carols Festival — the fourth in the administration of Governor Udom Emmanuel and this festival will be shown live on global broadcast media such as DSTV (on Africa Magic and dedicated channels), AIT, Channels TV and AKBC. To know more about the Carols festival, visit our website on http://www.akcarolsfest.com and plan to attend this grand festival.